The last word in dreamy opulence, this whimsical but stylish 4-star highly rated Dream South Beach Hotel really lives up to its name. 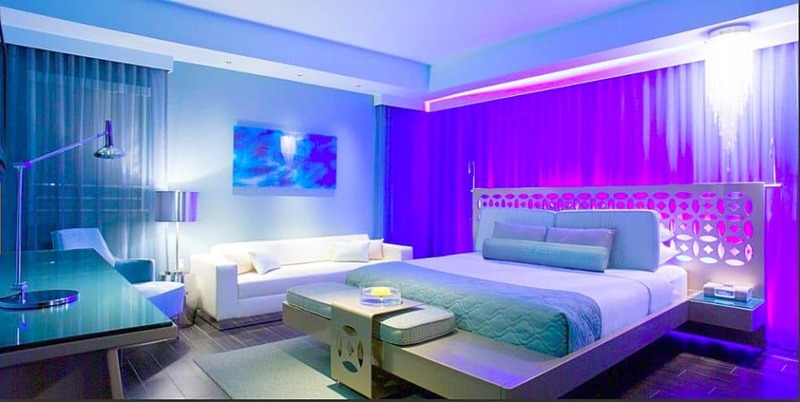 Housed in a registered historic Art Deco building, in a great position on South Beach inside you’ll find many of the rooms at this chic and trendy Miami hotel are bathed in an atmospheric blue light – all very zen! Guest comfort is taken very seriously here – you will have access to all the latest technology including flat-screen TVs, Bluetooth-enabled smartphones, iPod docking station as well as unique modern furniture (including the signature Dream bed). 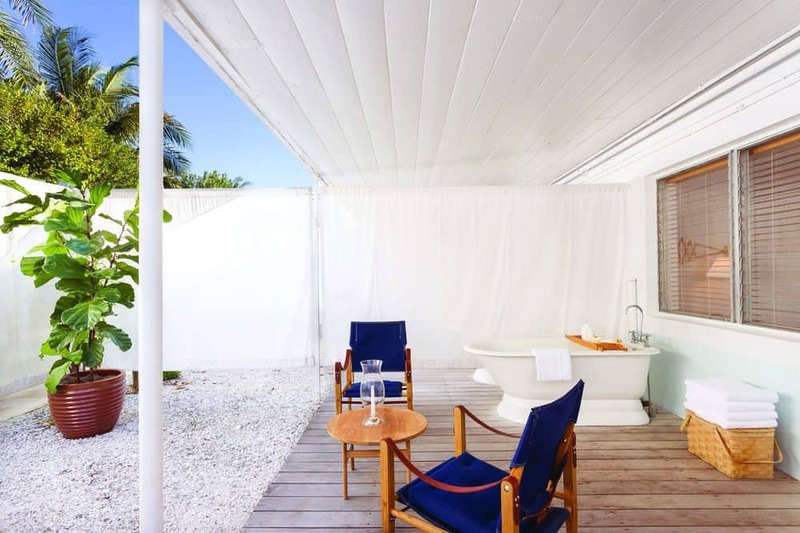 Opt for a lush upgrade and add in impressive dressing quarters, sundecks and outdoor showers. When you’ve finished quaffing champagne by the decadent rooftop infinity pool you can ease off the hangover with a trip to the hotel’s own Ayurvedic spa. 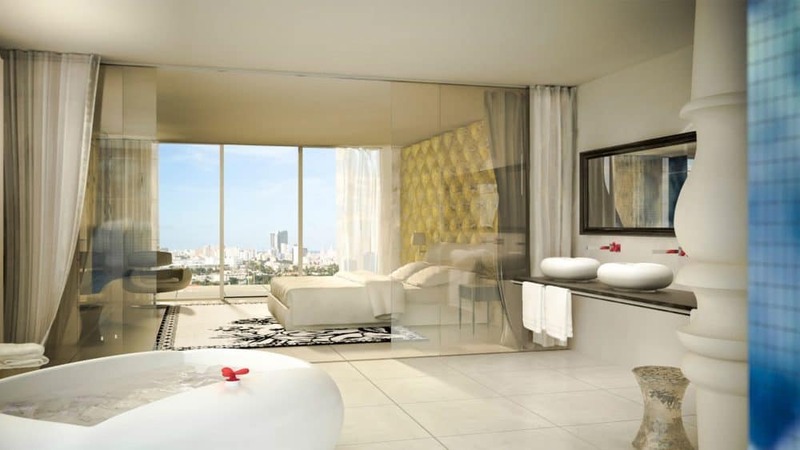 Fashionable and unique Miami luxury for a decent price! Prices from $130 per night. 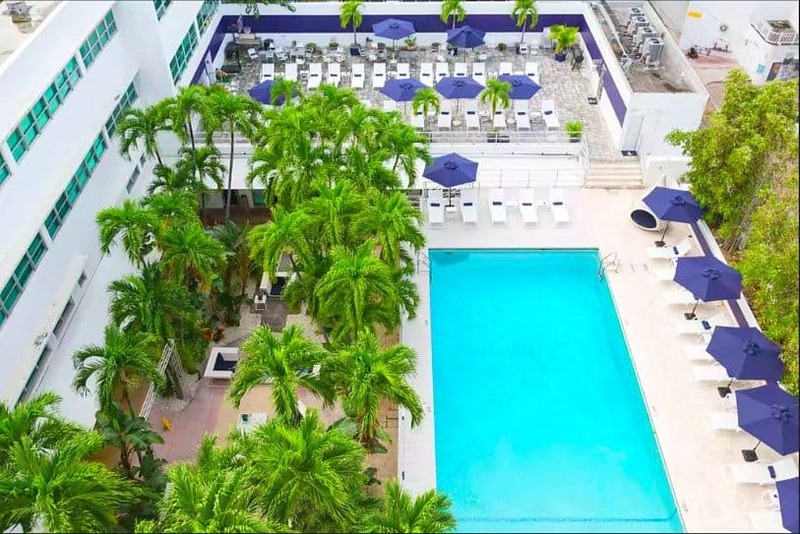 Located just 15 minutes drive from the main airport, the 4-star exceptionally rated East Hotel Miami is an upscale lifestyle hotel with an airy, contemporary design. 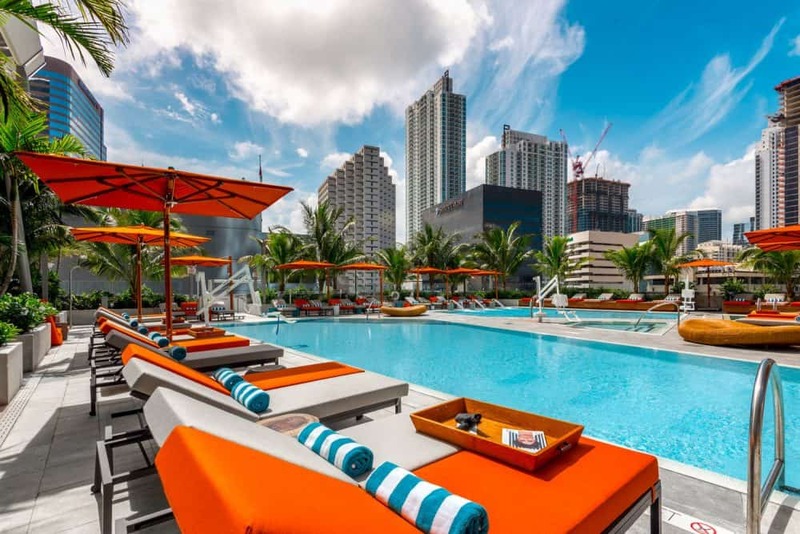 Located in Miami’s bustling hip Downtown area in Brickell City Centre, this cool Miami hotel is a fabulous choice if you’re a shopping addict and want to access the nearby top-brand stores. 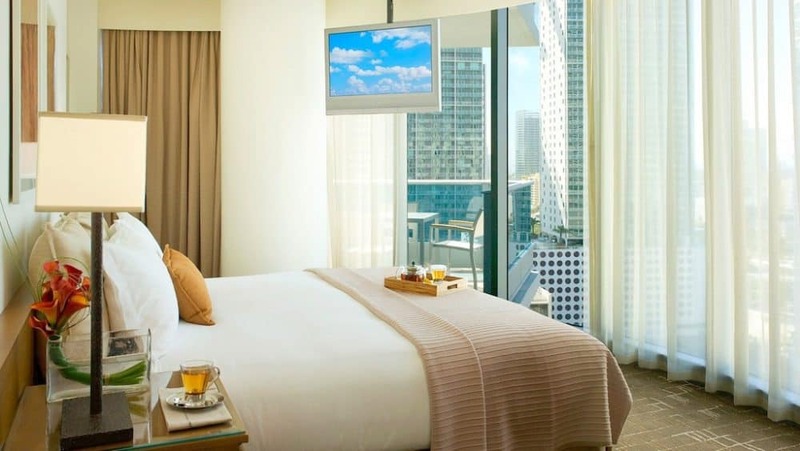 As well as the amazing views of Miami and Biscayne Bay (the hotel is a 6-minute walk from Biscayne Bay), the uber-trendy Miami hotel has over 300 rooms, each with walk-in rain showers, floor-to-ceiling windows, and super comfy mattresses. Upgraded rooms have wraparound balconies and/or gorgeous bay views. 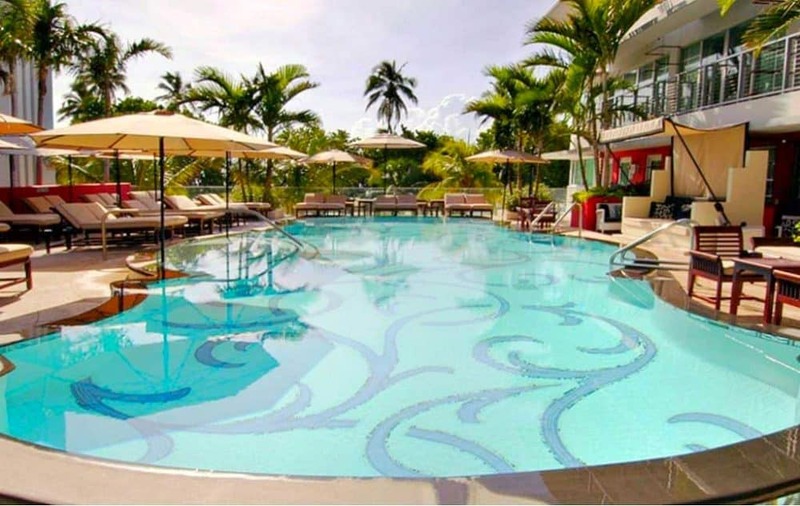 EAST Miami’s poolside area is spacious and inviting, featuring a poolside cocktail bar and plenty of sun loungers. If you want spectacular bay views, head to the rooftop bar and there are no less than four swimming pools to choose from. But if you prefer top-notch cuisine, the high-end Quinto La Huella restaurant is sure to satisfy your every taste! Prices from $200 per night. 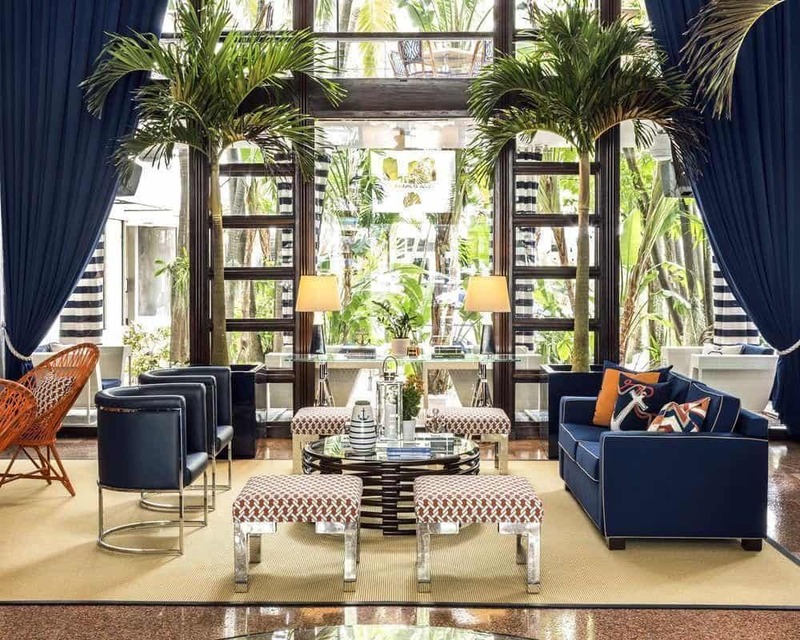 With its stunning and historic Art Deco frontage, the 4-star highly rated Kimpton Surfcomber Hotel is a trendy and popular boutique hotel situated in the heart of Miami’s South Beach. It’s just a short stroll away from the high-street stores at Lincoln Road Mall, the beach on Ocean Drive, or the Mediterranean vibe of Espanola Way. 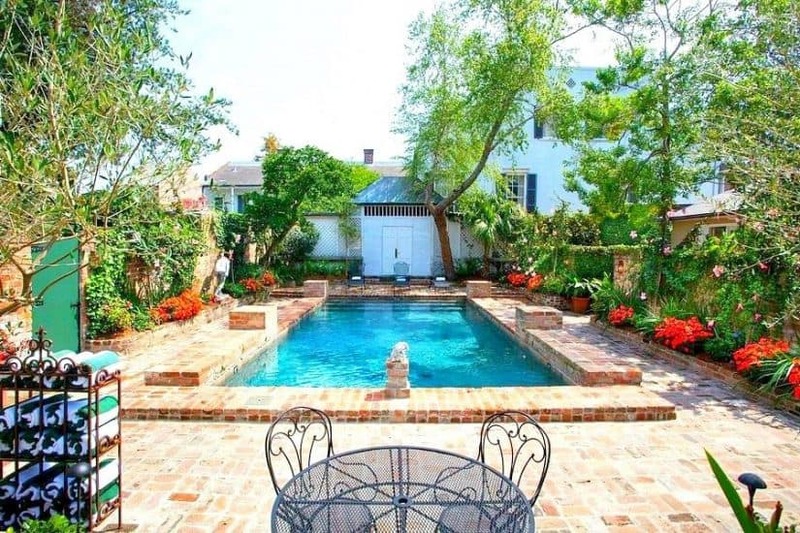 Among palm tree lined gardens, you’ll find a beautiful pool area that’s great for relaxing, dining outside, or for enjoying a cocktail in the sun. If you’re a party goer, the Surfcomber is a great place to stay, especially on weekends when the pool becomes a hive of activity. 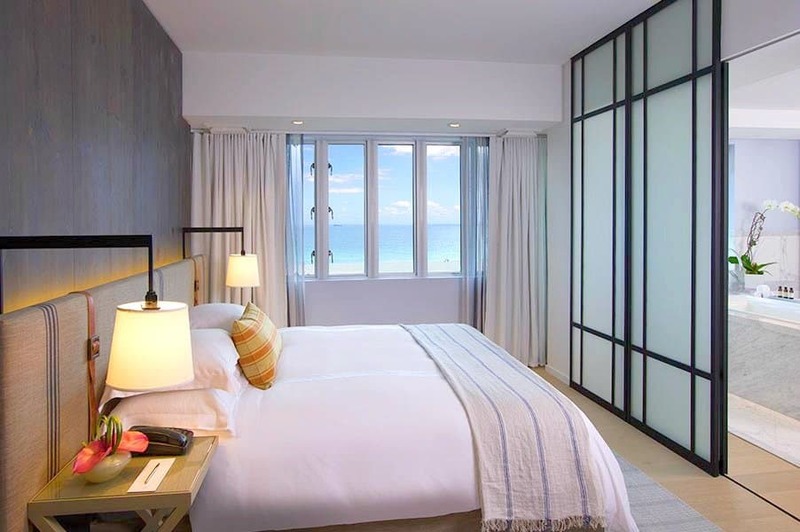 The rooms at the stylish and unique Miami hotel are elegant and functional, offering plush beds, a flat-screen TV, an en-suite bathroom, designer toiletries Wi-Fi, iPod docks and some have ocean views and furnished balconies. Other hotel highlights include an on-site American restaurant, a fitness centre, a funky espresso and juice bar, a full-service spa and a cute beach playground – bliss! 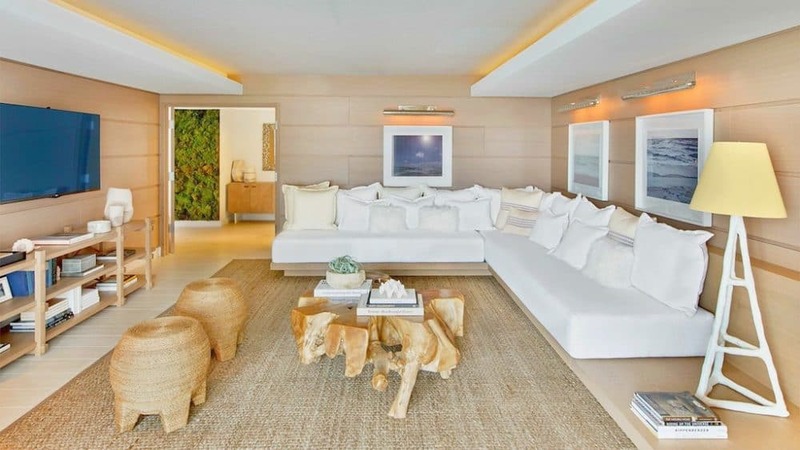 Situated in the northern section of South Beach on Collins Avenue, this swish Miami abode with an eco-friendly ethos has a modern beach feel with soft wood furnishings throughout. If you like to catch plenty of rays and enjoy the water, you can’t really go wrong with the 5 star exceptionally rated One Hotel South Beach. The hotel sits directly on the seafront so expect sublime ocean views, but it also boasts two swimming pools and 70,000 square-foot of decking space. Its rooms are modern and elegant, with soft furnishings, custom-made beds, ocean views, walls lined with driftwood, and all the mod-cons you’d expect. 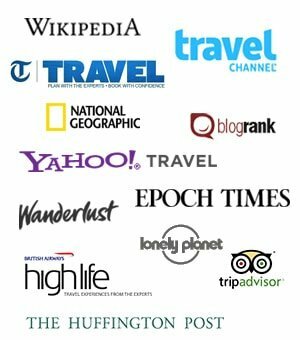 The trendsetting Miami accommodation is located near plenty of popular attractions, including the Lincoln Road Mall, the New World Center, and Miami Beach Convention Centre. A large swimming pool occupies the hotel’s central grounds, while there’s a smaller but equally stunning beachside terrace and pool area – complete with bar, sun loungers, daybeds, and cabanas. Besides its popular pool areas, the hotel features a gym, a rooftop bar, a hair salon and also a modern spa. If you’re a golfing fan, the hotel is ideally located near to Miami Beach Golf Club, so don’t forget to pack your clubs! The 4-star exceptionally rated Confidante Hotel on Miami Beach adds a touch of old-school glamour with its 1940s Art Deco skyscraper, Art Deco furnishings and a relaxed style that’s typical of Miami. 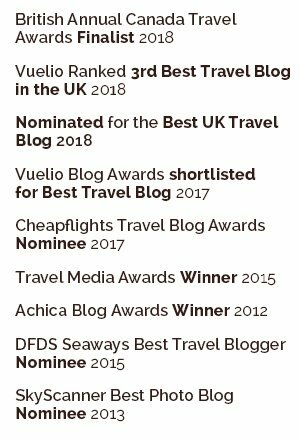 Located on the popular Collins Avenue and overlooking the beach, the award-winning hotel is in a prime spot for exploring the wider city area. 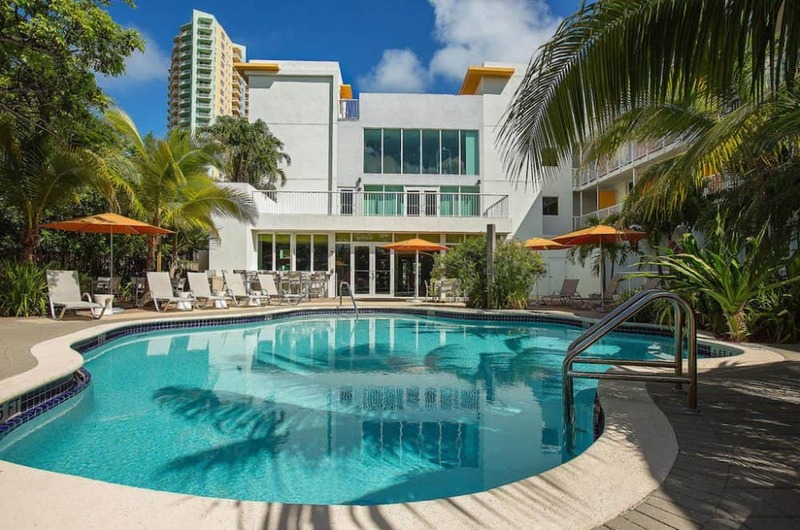 Upon arrival, you’ll notice the hip Miami hotel is equipped with two outdoor heated pools, an open-air rooftop, a fully equipped gym, and even a spa and hair salon. If you like to sunbathe, the well-maintained outdoor areas have plenty of loungers and cabanas. But if you prefer the beach, direct access is available from the hotel. The rooms are stylishly quirky and well-decorated. Room have a private balcony, free Wi-Fi, and a flat-screen television and upgrades offer separate living areas and kitchens with wet bars and fridges. Also expect a rooftop spa, a hair salon a variety of contemporary restaurants and cocktail bars are also available for you to enjoy. 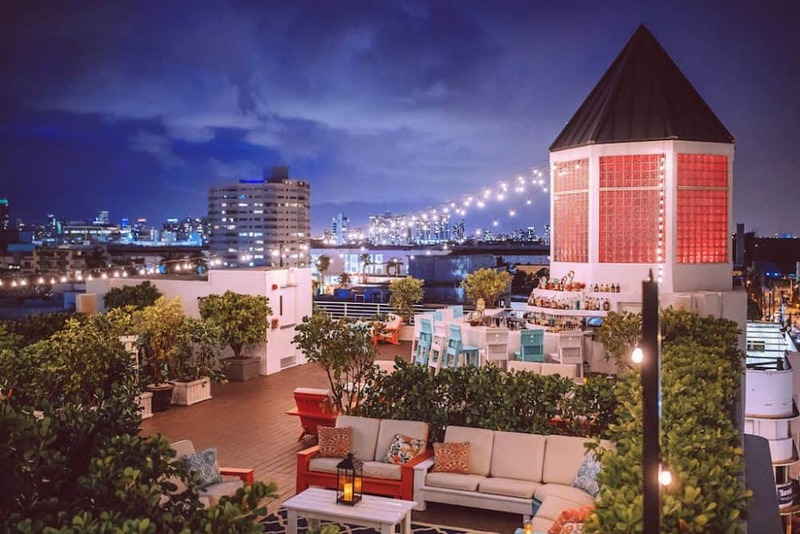 This 1930s boutique hotel occupies a prime spot on Miami’s South Beach and is well-positioned if you want to sample Miami’s nightlife, restaurants, and entertainment venues. With its Art Deco architecture but playful French style interiors, the 4-star highly rated SLS Hotel South Beach has a classic, elegant feel that manages to combine a relaxed vibe with plenty of sophistication. 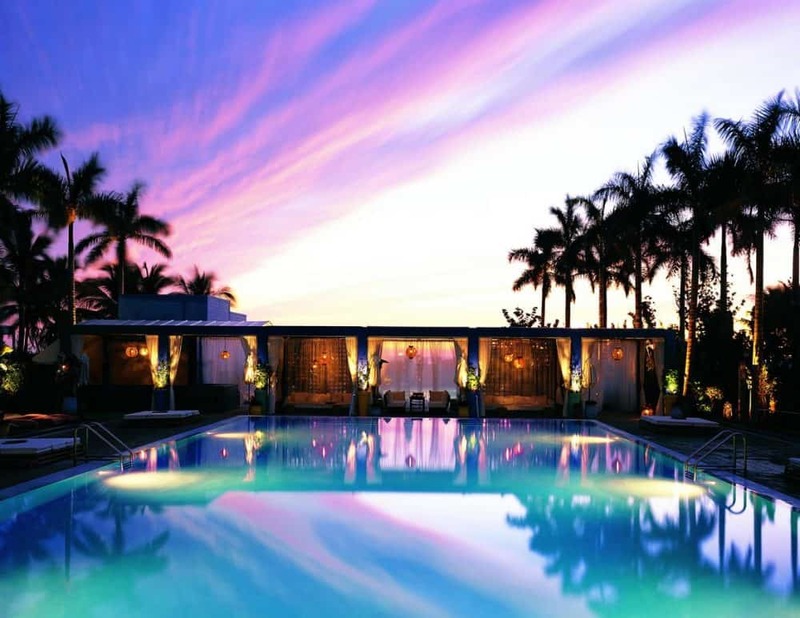 In particular, the cool and unusual Miami hotel is renowned for its pool parties and colourful nightlife. It has a classy feel that’s fun but well-mannered. Inside the creative accommodation, you’ll find the rooms are spacious and sumptuous, offering high-end luxury alongside Miami’s lively beach scene. Additional benefits include a fitness centre, flat-screen TVs, and fast Wi-Fi. 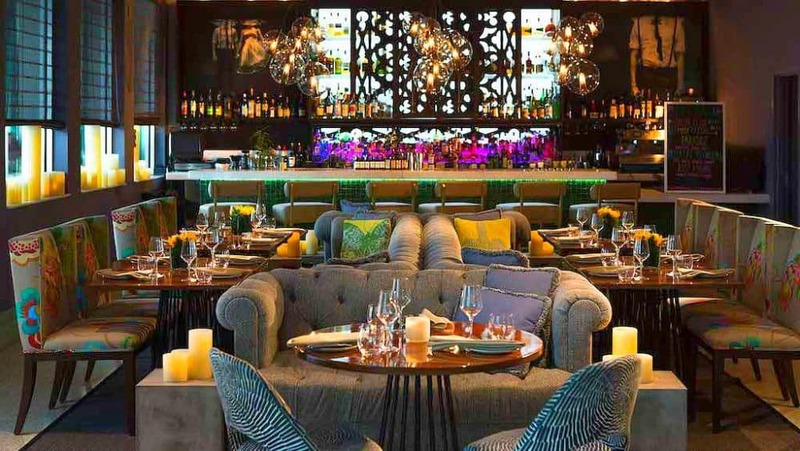 The SLS South Beach boasts two fantastic restaurants offering a range of international food dishes. Besides this, you’ll find an inviting swimming pool, poolside bar, and amazing views across the ocean. 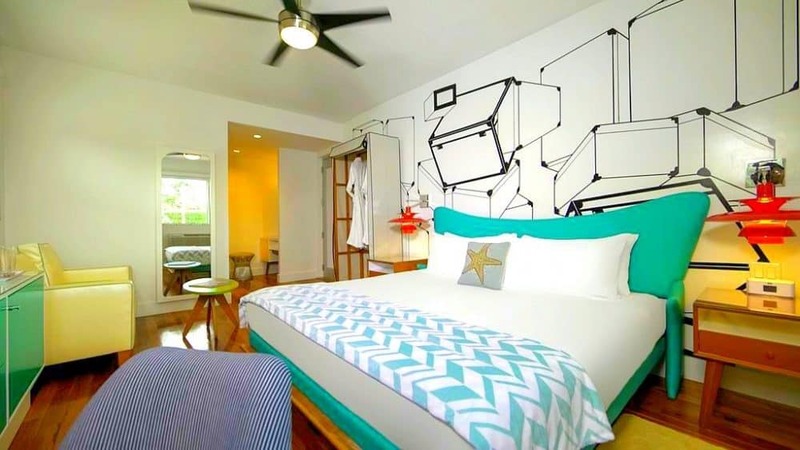 The fun and funky Hotel Urbano offers mid-range boutique accommodation in a quiet but central location in Miami. 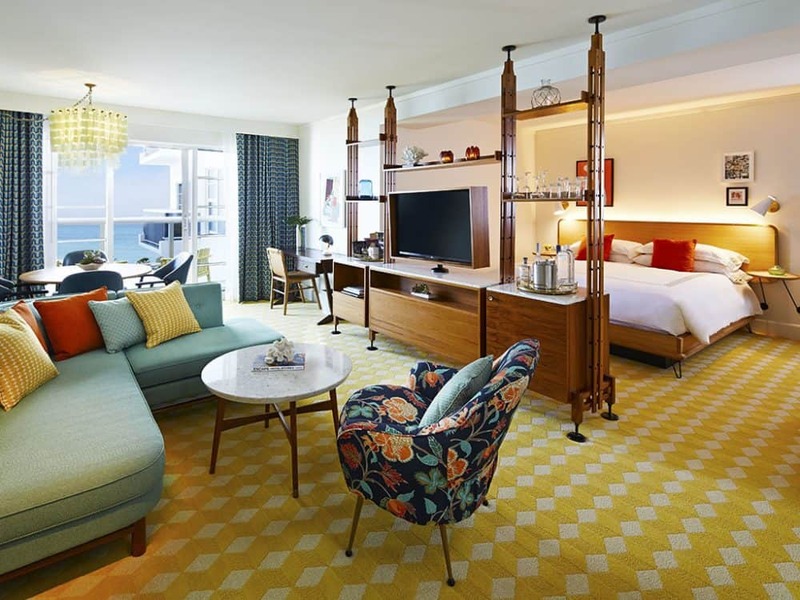 Bold and creative with cool retro interiors, the hip and trendy Miami hotel has partnered with Art Fusion Galleries to display an eclectic range of exhibits throughout the hotel. 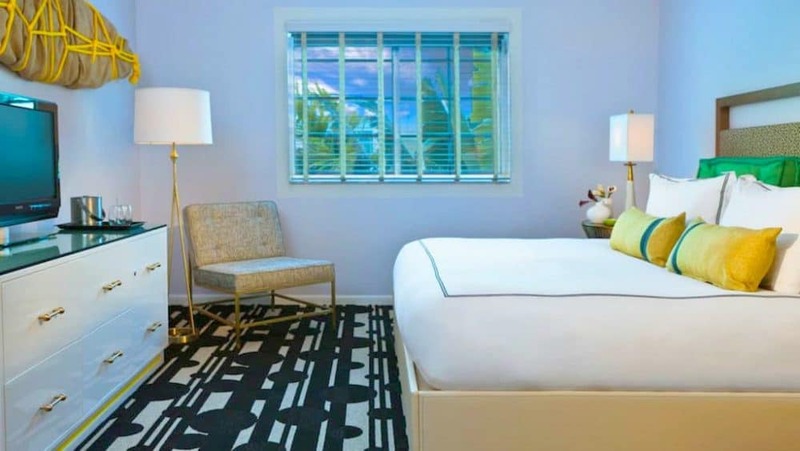 Rooms at this funky accommodation in the heart of Miami are stylish and colourful and all the amenities of contemporary living will be at your fingertips – from iPod dock to HDTVs with balconies thrown in too. 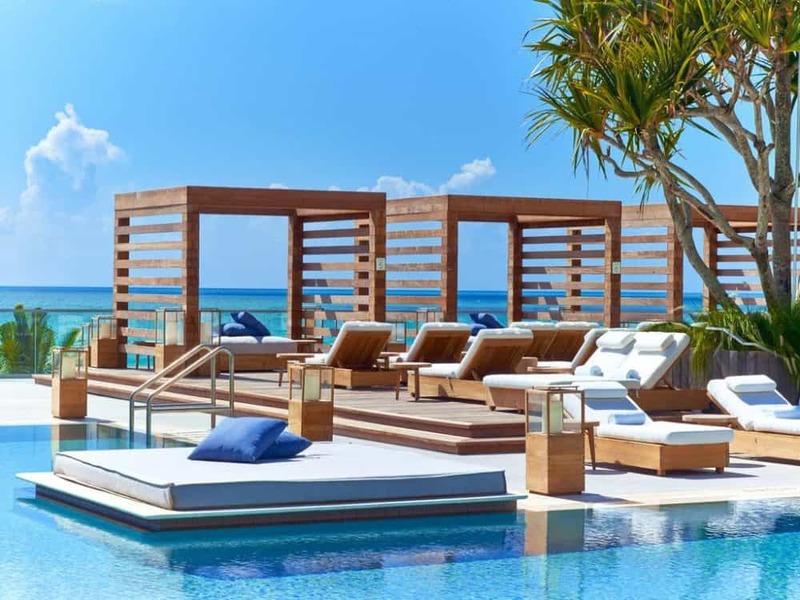 Other unique hotel highlights include private poolside cabanas, a modern cocktail bar, a state-of-the-art gym and Cuban-inspired food freshly served up at their popular onsite restaurant. 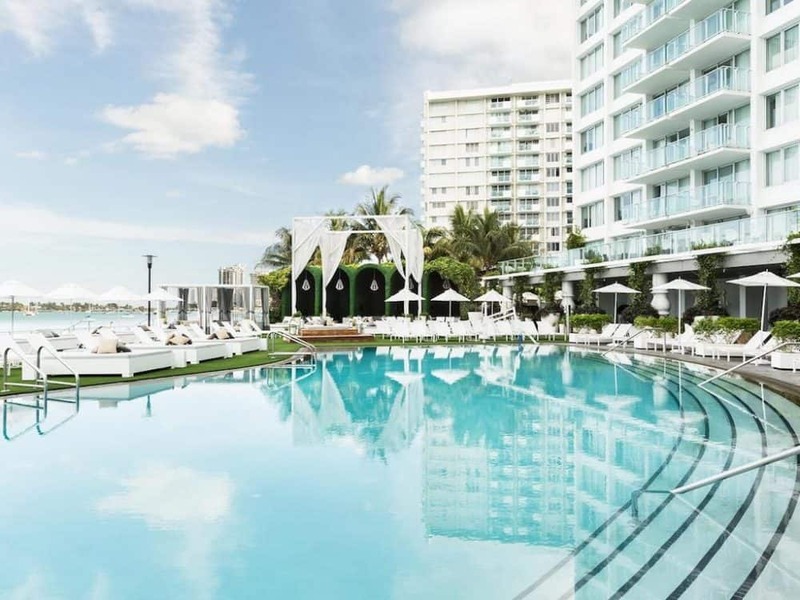 In an area filled with hotels desperately trying to be hip, the 4-star highly rated Hotel Victor Miami Beach keeps it chic and stylish courtesy of French designer Jacques Garcia. Housed in an Art-Deco building in Downtown Miami and decorated with tasteful colours, rich fabrics and offering gorgeous sea views the result is a luxurious hotel without the exorbitant room rates. 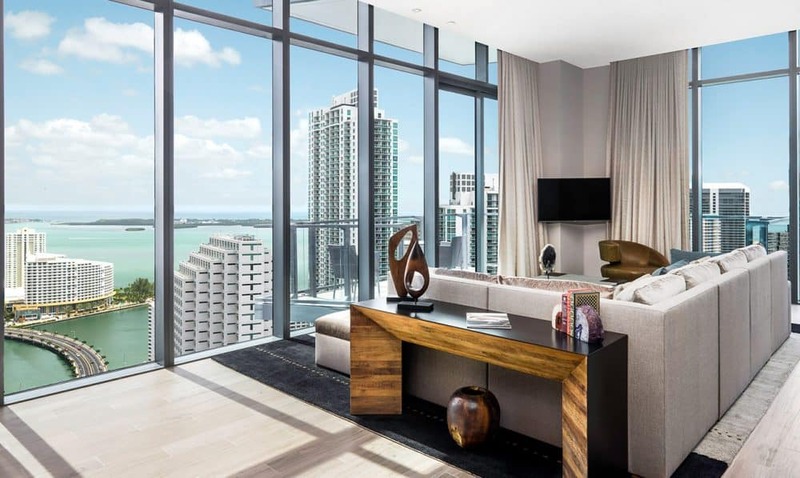 Rooms at this sleek Miami accommodation come with some lavish touches including a well stocked mini bar, 300-thread-count sheets, flat-screen TVs while suites have kitchenettes and private balconies or terraces with hot tubs. In all the rooms you can also connect to Neiman Marcus personal shoppers at the touch of a button. 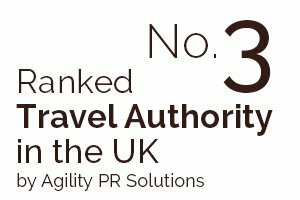 Other highlights include an on-site spa, Turkish bath, access to iPads, a sushi bar and a cabana-dotted pool. Prices from $140 per night. Following hot on the heels of the popular Los Angeles Standard is the Florida-based version. More like a high-end spa with guest rooms than a hotel, the lush Miami accommodation provides a wellness experience that is said to be “part recovery centre, part hydrotherapy playground, part new-age ashram.” You’ll probably leave a few toxins lighter staying at the Standard Hotel Miami with its up-to-the-minute centre for integrated wellness including a hydrotherapy spa, a hot tub with a waterfall, a cold plunge and mud baths and healthy vegan options on offer – all perfectly complementing its tranquil and lush Belle Isle location (just off Miami beach). 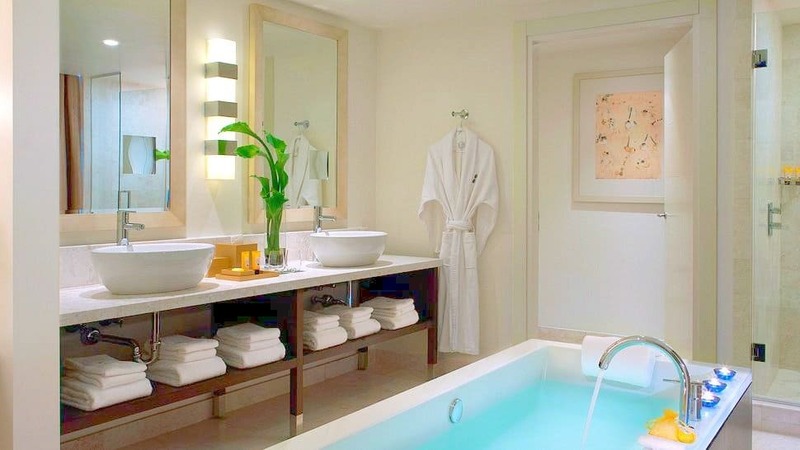 Rooms at this gorgeous Miami hotel are equally swish with tasteful wooden floors and upgrades have terraces complete with soaking tubs. 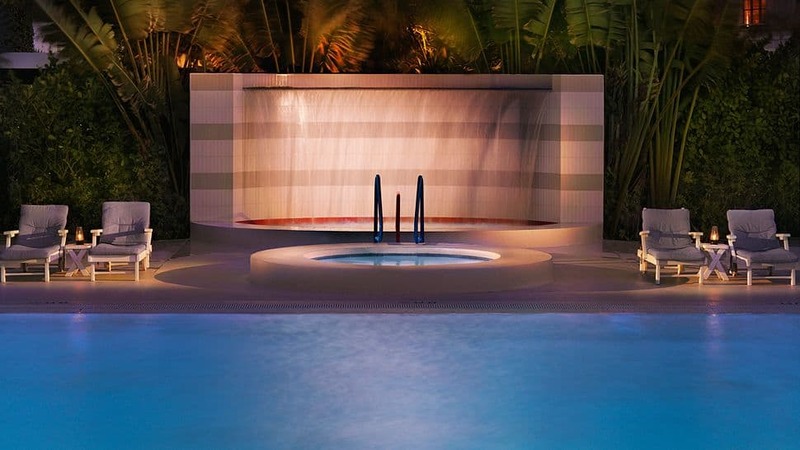 Also, expect an onsite bayside Mediterranean restaurant and a divine infinity pool – a beautiful Miami gem! Prices from $180 per night. 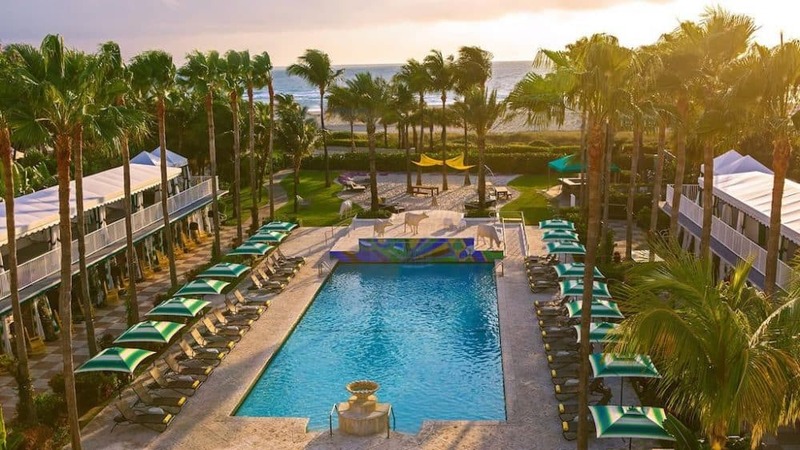 Set overlooking Miami’s beautiful South Beach and the Atlantic Ocean, the 4-star exceptionally rated W South Beach is a large oceanfront hotel with a stylish but relaxed vibe. Numerous shops, bars, restaurants and clubs are within a 10-minute walk and the striking decor is modern and tasteful, with the hotel making use of quirky furniture pieces throughout. The suites at this ultra-trendy Miami hotel let in plenty of natural light and feature private balconies, comfortable beds, walk-in showers, and large flat-screen TVs. 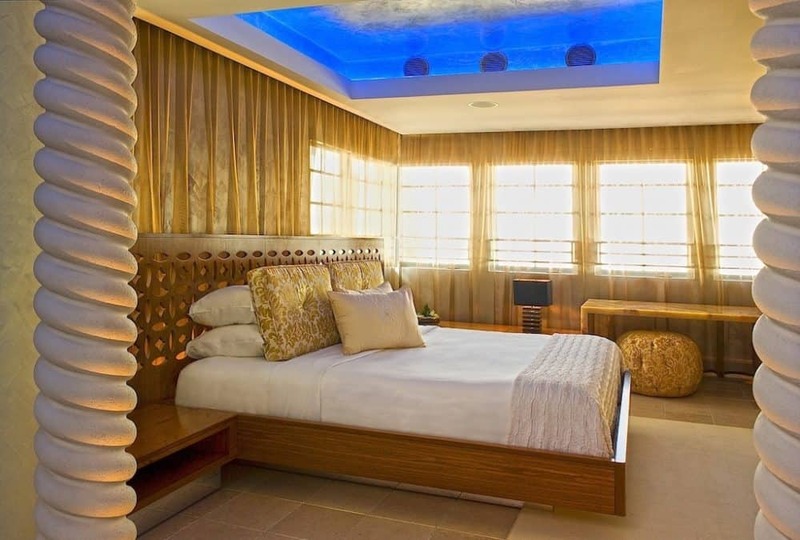 Upgraded rooms are even more special with kitchenettes, living rooms, barbecue grills and/or plunge pools. If you’re into your fitness, you’ll be pleased to hear that a 24-hour gym is available on-site. 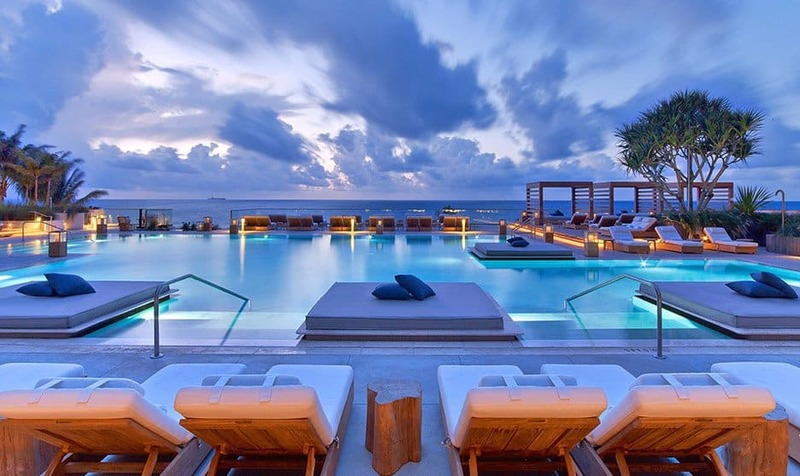 The hotel also has its own nightclub with a full bar serving a mixture of cocktails, beers, wines, and spirits, two swimming outdoor pools, a contemporary spa and even rooftop basketball and tennis courts – you’ll never want to leave! Prices from $240 per night. 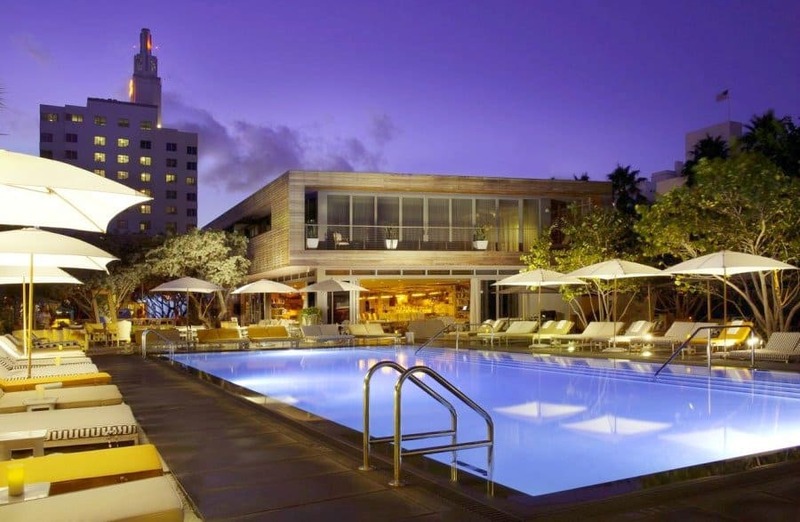 Set overlooking Biscayne Bay, the 4-star exceptionally rated Mondrian South Beach Hotel offers simplistic modernist luxury in a relaxed part of Miami’s South Beach area. If you’re looking for a more tranquil setting, but still within easy reach of the resort, the Mondrian is perfect. The unique and sophisticated Miami hotel combines a fresh, modern look with the added ingredients of classic furnishings. One particular example is the impressive floating staircase, which you’ll immediately notice upon access to the lobby. The hotel is just a 15-minute walk to South Beach with its many shops, restaurants, and entertainment venues. In the stylish rooms, you can enjoy floor-to-ceiling windows with city or bay views, a 42-inch flat-screen TV, wall artwork, a rainfall shower, Wi-Fi and kitchen facilities. Some have balconies and the hotel’s main outdoor pool area provides plenty of loungers for relaxing in the sun, plus has stunning views across Biscayne Bay and Downtown Miami. There’s also a hip indoor-outdoor bar al fresco and indoor dining, a private marina and a 24-hour fitness centre at this chic retro-inspired Miami abode. Prices from $170 per night. 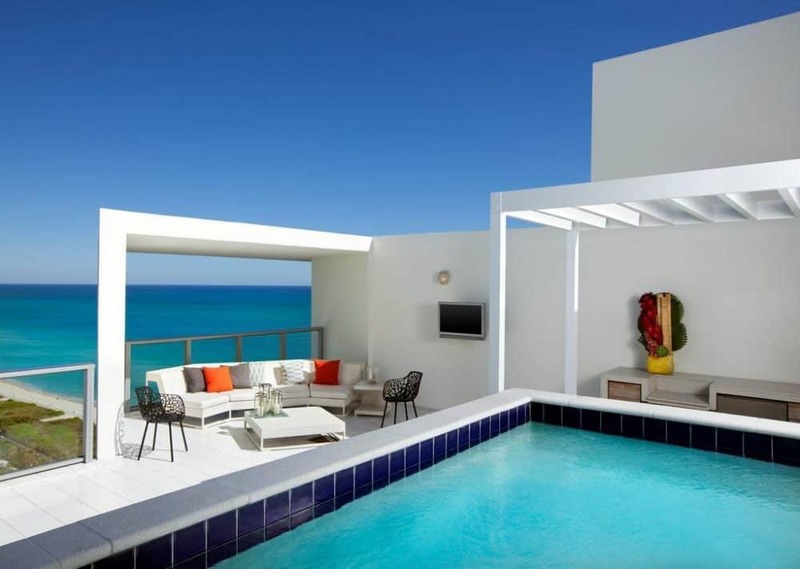 The 4-star highly rated Shore Club South Beach is nestled next to the shoreline on popular Collins Avenue. With its Art Deco theme, the chic and trendy Miami hotel is ideal if you want to be situated near nightlife, shopping, and plenty of eateries and bars. The hotel has a cool, relaxed vibe in the daytime and becomes livelier at night with its glitzy poolside scene. 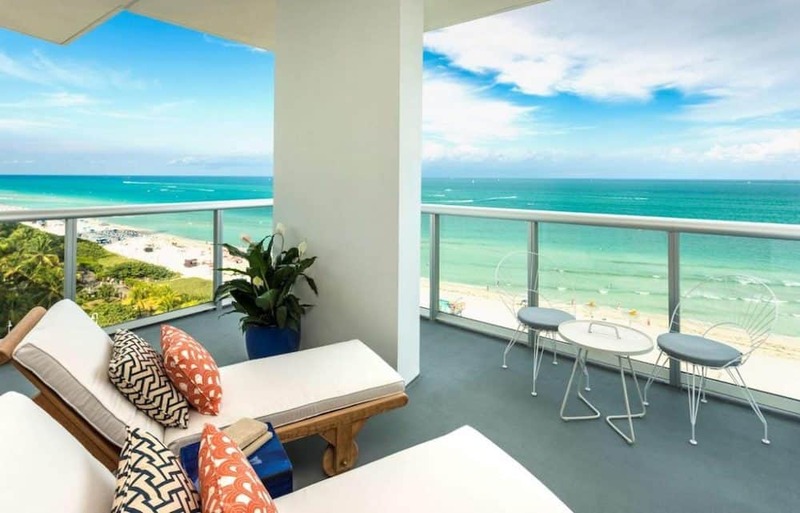 It offers guests direct access to the beach and is within easy reach of the South Beach and the Downtown areas. The Shore Club has spacious rooms that are modern and clean, each featuring a walk-in shower, bath, flat-screen TV, iPod docks and soft furnishings. Upgraded rooms offer living rooms and whirlpool tubs and there are private bungalows also on offer with their own outdoor dining areas. Other notable features of this lush and funky Miami abode include restaurants offering international cuisine, two infinity pools, a hot tub, a fitness centre, and a well-equipped modern spa. The 4-star exceptionally rated EPIC Hotel located on the Miami River in Downtown Miami is a swanky, modern complex that guarantees fantastic views across Biscayne Bay and beyond. 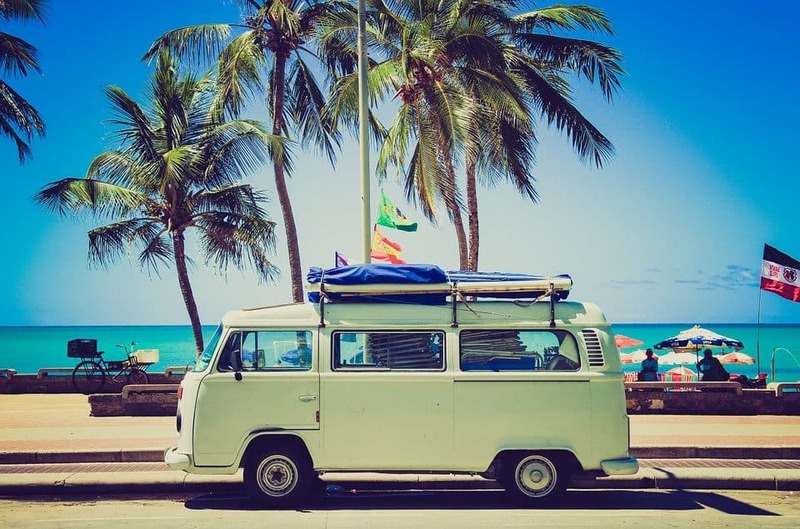 Being a mere 15-minute drive from Miami International Airport, it’s really easy to get to, and it’s also a short drive from all the fun at Miami Beach. Part of the ever popular and exclusive Kimpton range, rooms are as lush as you’d expect from a high-end hotel, with floor-to-ceiling windows, a 55-inch flat-screen TV, a private balcony, rain head showers, yoga mats (of course! ), freestanding bathtubs and many with ocean views. The unique Miami boutique hotel also has its own private dockside port, so you can even rock up to the doorstep on your yacht (if you can afford one!). A gymnasium and beauty spa are available to keep you fit and looking great, there’s a sociable evening wine hour, a marina, a modern gym, a spa with skyline views, two restaurants, a stunning 16th-floor rooftop with a pool area and cabanas which lets you experience the fabulous Miami sunsets! Prices from $150 per night. For all you hipsters out there, the midrange exceptionally rated Vagabond Hotel on Biscayne Boulevard is conveniently located in Downtown Miami. The funky Miami hotel has a timeless retro theme with a relaxed vibe that is sure to suit you if you’re a stylish, discerning traveller. 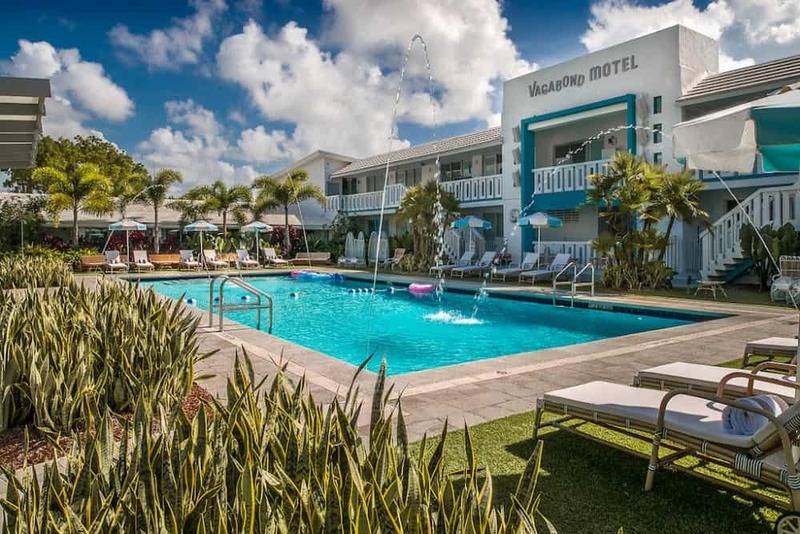 Although a small hotel with only 44 rooms, the hip Miami boutique has plenty to offer, from its 1950s-style kitschy furnishings, bold geometric art and comfy beds to flat-screen TVs and a cool outdoor pool. The ultra-hip cocktail bar is ideal for grabbing a relaxing drink, while the upscale restaurant offers a variety of international cuisines. The recently refurbished rooms are surprisingly spacious, with many opening onto well-kept gardens awash with palm trees. And if that doesn’t tempt you, this fun and funky Miami abode also includes high-speed Wi-Fi, a mini fridge in every room, and a gymnasium. Prices from $110 per night. 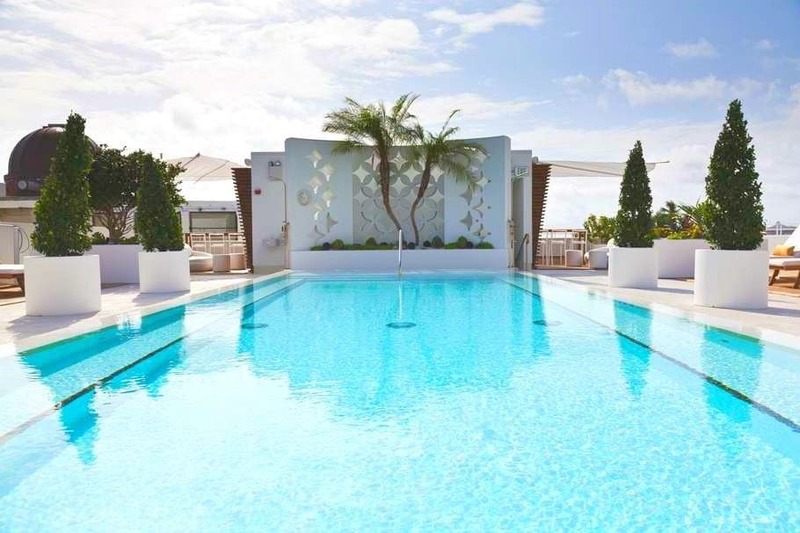 Channelling a 1930’s style Miami chic, the highly rated Albion Hotel Miami Beach is unique midrange boutique only a very short hop from South Beach. Located in the famous Art Deco district there are 100 minimalist guest-rooms on offer which feature free WiFi and comfy furnishings. Opt for a funky penthouse suite and expect terraces and cool original art. The outdoor swimming pool is pretty swish and is lined with palm trees, sun decks and a bar but if you’re more of a beach bunny you’ll also have private access to the beach and hireable beach equipment. Bright and airy and heavy on the white, the midrange highly rated Townhouse Hotel is a great example of when a boutique hotel gets the shabby chic style just right (and that’s not an easy feat)! From the moment you step inside this unique and creative hotel in Miami you’ll be able to tell the interior designer was in a playful mood – think oversized baby blue pillows, L shaped couches (suitable for crashing guests) giant pouffes and the odd beachball. Penthouses have private terraces, and ocean or city views. There’s a funky rooftop terrace and bar and each room also contains a flat-screen TV, iPod docking station and complimentary Wi-Fi. Modern relaxing accommodation with a hip, cool twist located right on South Beach! 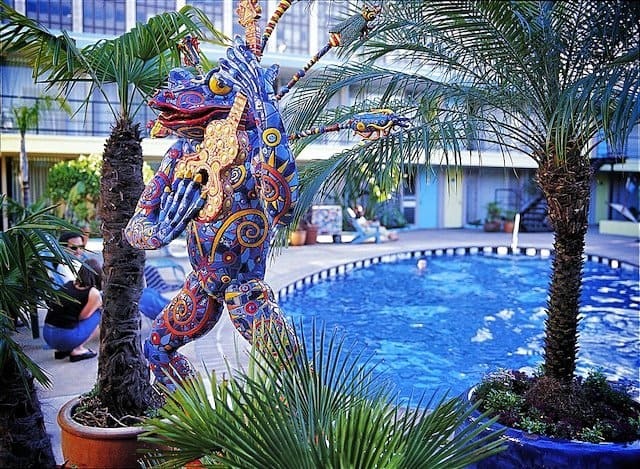 If you enjoyed 10 cool and unusual hotels in Miami, we also have a Top 10 Cool and Unusual Hotels in Los Angeles and Top 10 Cool and Unusual hotels in New York. I think everyone thinks Miami when it comes to Florida, however Gulf Coast is also beautiful, less crowded. We have been to Destin, Florida and was really surprised to find such clear waters in the USA. Town itself was also very beautiful. I want to try that bath out in the Standard Miami..
Hi Becky, stunning images, great list! Next time I’ll be in Miami, I’ll definitely know where to choose from for an accomodation! 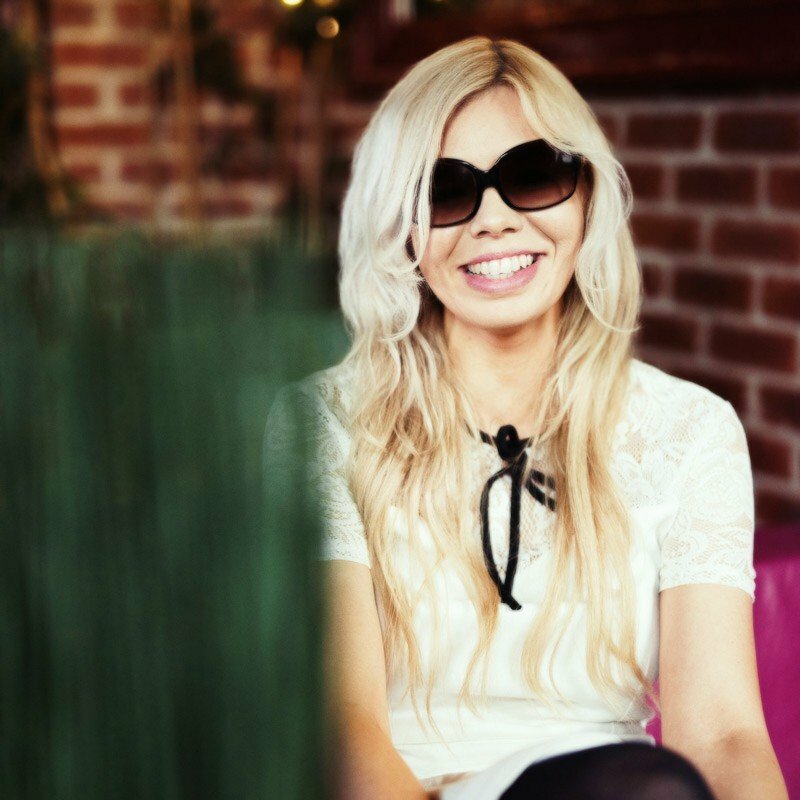 As always, awesome article! I am a fan of your work. You take me places.